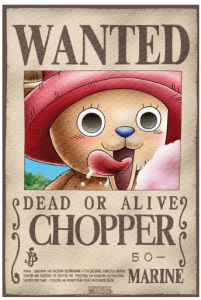 If you came here looking for the newest wanted posters of One Piece, then you don’t have to look any further. We have assembled our favorite choices and we believe you won’t be disappointed. And if you think we just have a few recommendations, you’re wrong. Our aim was variety here, so let’s start off! Our first recommendation today is this 16 piece set from Cosplaywho. 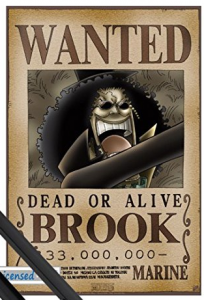 It features the updates bounties of all the Straw Hats, as well as those of Whitebeard, Shanks, Mihawk, Ace, Boa Hancock, Jinbei and the Pirate King himself Gol D Roger! All the poster pictures are separate and the individual dimensions of the cards are 42x29cm(or 16.5×11.5 inches). To make the deal even sweeter, Cosplaywho provides you with their official gift card. 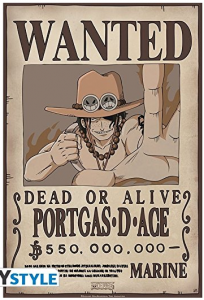 To sum up, if you want to get a beautiful collection of wanted posters with updated bounties, you don’t have to look any further! I know, I know. You only love the Straw Hat Pirates. 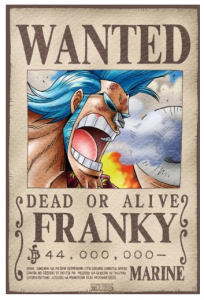 Who wants old man Whitebeard’s poster in their room? If you are in this category, worry no more. We’ve got you covered! 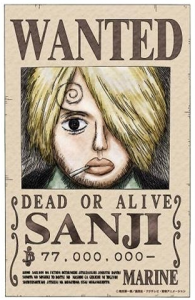 Well, Bluefun’s got you covered with their Straw Hat-only wanted poster collection. One nice choice Bluefun provides you with is the size of the posters. They offer two variations at 8.3×5.7inches and at 16.5×11.5inches. If you decide to get the smaller ones you can even save some money ;). For those of you who love the Straw Hats, but also have a particular liking to Law, Sabo and Ace, I can’t recommend this 12 piece set enough. 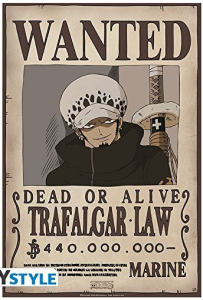 The Straw Hats are here with their updated bounties and pictures, as well as Law, Sabo and Ace. The dimensions of each poster here are the typical 42x29cm. 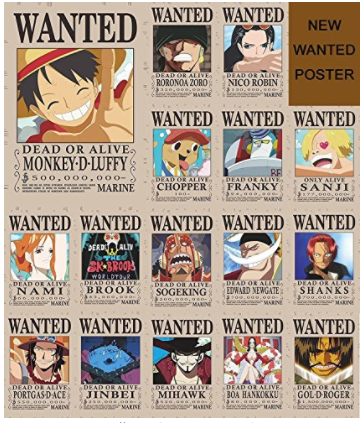 To further help you fulfill your needs, we thought it would be good to provide variety for these wanted poster sets. After all, different combinations may apply to different individuals among you. 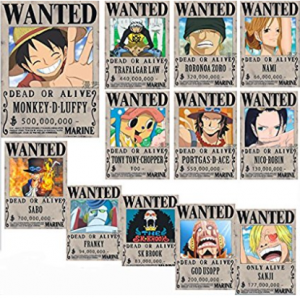 Here we have an 11 piece collection of wanted posters from Topbill. The additions to the Straw Hats here are Shanks and Portgas D Ace. Their dimensions are about 8×10 inches. 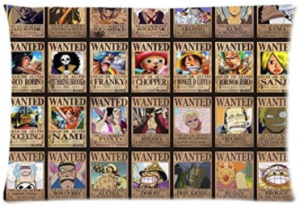 What’s important to know here is that the bounties and wanted posters of this set are NOT updated. They are the first posters that appeared for each character the very first time. For those of you who wanna remember the early days of One Piece, it may be the best choice. I believe that the collectors among you know what I’m talking about. 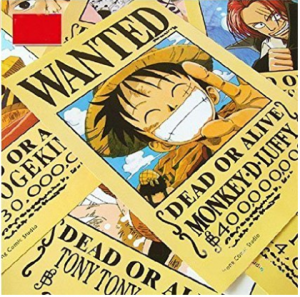 This wanted poster collection is extremely limited(I don’t even know if any will still be available when you’re reading this) and is the original wanted poster collection of the Japan exhibition. They look exactly like the ones at the anime(maybe the only ones that are exactly the same). The bounties are un-updated here as well and the set is comprised of 16 pieces. 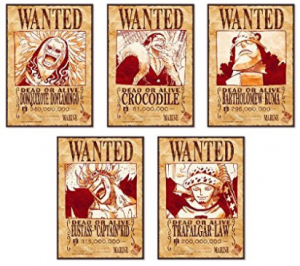 The Straw Hat Pirates, as well as Crocodile, Donquixote Doflamingo, Boa Hancock, Ace, Trafalgar Law, Bartholomew Kuma and Captain Eustass Kid. 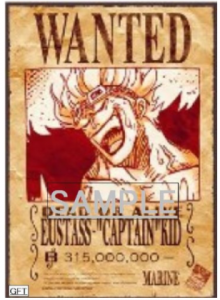 Another really rare find was this Eustass Kid wanted poster from 2012. It is a discontinued rare item like the collection above, so you can understand how limited they are. They are sold at high prices all over the world and some people find it hard to even find them nowadays. Be sure to check it out. Well, collections are well and good. They are certainly value for money since you buy in bulk and you can make a collection with just one purchase. 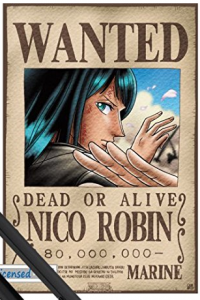 But what about individual wanted posters? What if you just love some characters more than others? 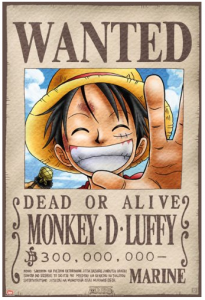 (racist detected :P) What if you already have some wanted posters and just want to add to your collection? 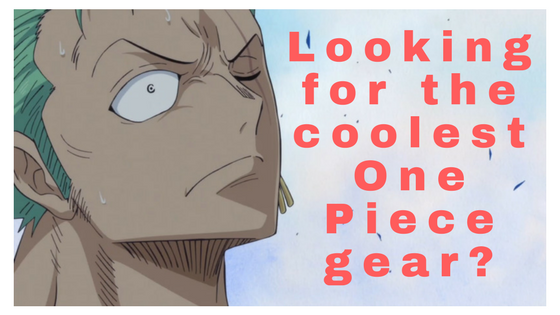 Well, OnePieceTheories once again has got you covered! 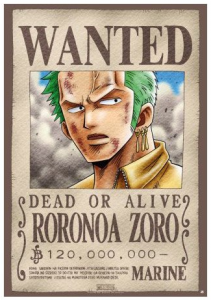 Below are our favorite individual wanted posters of characters other than the Straw Hats! 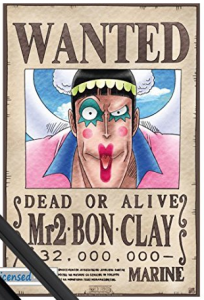 Mr. 2 Bon Kurei‘s wanted poster with two poster hangers! A 20×14 inches poster that comes with a set of black poster hangers as well, for you to hang it of course :P! 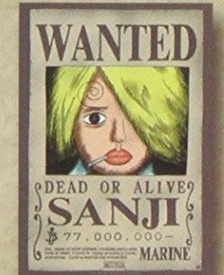 In my research of the top wanted poster products, I came across some odd but quite interesting purchases that I never thought even existed. I believe it is worth mentioning some of them. If you are a lover of solving puzzles, as well as a One Piece lover, then this puzzle is the perfect fit for you. It is a 1000-piece one(not a One Piece here, pun intended :P) so you’ll have much work to do. 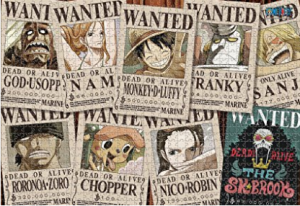 Of course, when the puzzle is solved, the 9 updated wanted posters of the Straw Hats emerge. 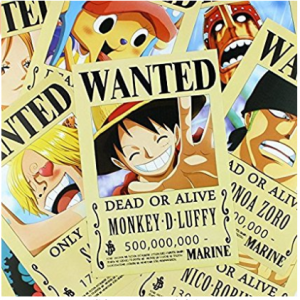 Note that Ensky, the company that makes the wanted jigsaw puzzles, has created many individual 150-piece puzzles of different One Piece wanted posters. Be sure to check them out! 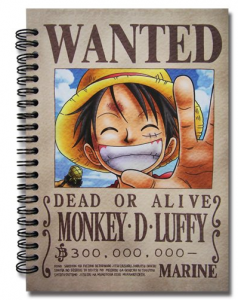 Take your favorite notes with this notebook that features Luffy’s wanted poster on its front page! 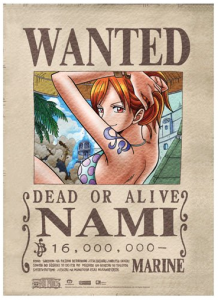 I hope you liked our suggestions about wanted posters of One Piece and other interesting stuff related to them. I also hope that you won’t make any buying decisions you will regret :P! Because I sure did! Who needs this pillowcase :P? Thanks, nakamas and I’ll see you next time with more ridiculous purchasing ideas :P! Happy you liked the suggestions Keiran. I also love the pillowcase :P. Check more interesting anime gear in our reviews/recommendations page. 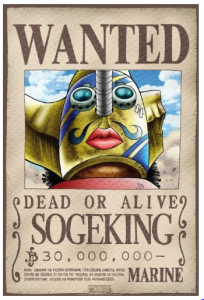 I thought I had a pretty decent collection of wanted posters until I came on your website. I do’t have any of these wanted posters in my collection. I’m definitely going to start ordering them until I have all of them in my collection. I saved your website to my favorites for future purchases. Glad I helped to point you to the right direction Jack! 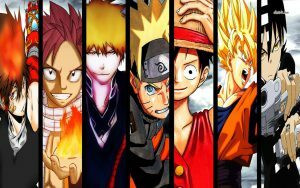 Check our reviews page for more anime gear! 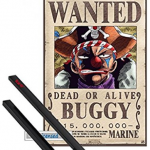 Previous Previous post: Captain Buggy One Piece – What secret does he know? Next Next post: Silvers Rayleigh One Piece – Why is he called the Dark King?